American zoologist and writer who studied mosquitoes and tropical diseases. He was also an environmental activist. In The Nature of Natural History (1950). 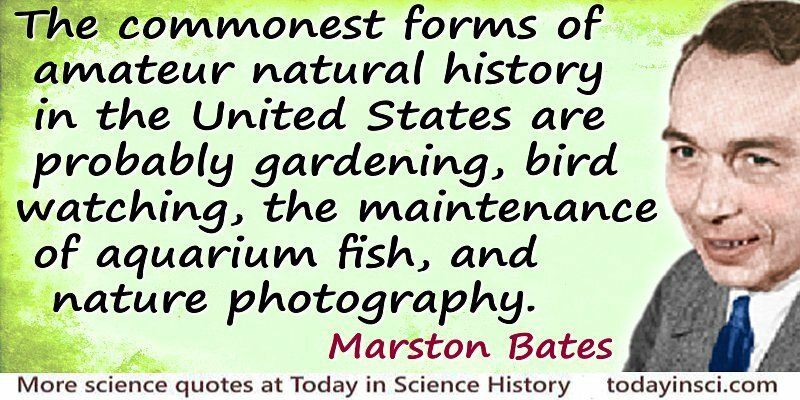 After this quote introducing gardening, bird watching, aquarium maintenance and nature photography as activities of nature-lovers, Marston Bates wrote in his book, The Nature of Natural History commenting on how bird watchers are the best organized of these groups. They were able to contribute to scientific knowledge with data from annual censuses. He also identified how photography was an invaluable illustrative aid in all fields of science. Science Quotes by Marston Bates. 23 Jul - short biography, births, deaths and events on date of Bates's birth.